Japan Display will supply the OLED screens for this year's new Apple Watch model, according to a new Reuters report out today. Japan Display Inc will begin to supply organic light-emitting diode (OLED) screens for the Apple Watch later this year, two sources said, a breakthrough for the cash-strapped company whose late shift to OLED has cost it orders from Apple. The supply deal would mark Japan Display’s foray into the OLED display market, the two sources familiar with the matter said, declining to be identified because they are not authorized to speak to the media. The development comes as particularly good news for the liquid crystal display panel supplier, which relied on Apple for more than half of its revenue in the year ended March 2018, and whose mainstay LCD business has been hit heavily by Apple's recent shift away from LCD. There have been reports of less-than-stellar sales of iPhone XR, which uses LCD. It's also rumored that Apple could drop LCD displays for its 2020 iPhones in favor of an all-OLED line-up. As a result, Japan Display has been seeking investor help that will put it on firmer ground before the switch takes place. Reuters reported on Monday that Japan Display aims to raise as much as $990 million in new financing as early as this week. Apple has been working to bolster its OLED display supply chain cut down its reliance on Samsung, which supplies displays for the iPhone X, iPhone XS, and iPhone XS Max. It has reportedly pushed LG Display to build out its OLED display production facilities, and has even purchased equipment to build an OLED panel research and development site in Taiwan. Today's report offers little clue as to what the switch to Japan Display OLED screens could mean for the next Apple Watch, save for a note that newer OLED technology is generally thinner and allows more flexibility than LCD screens. 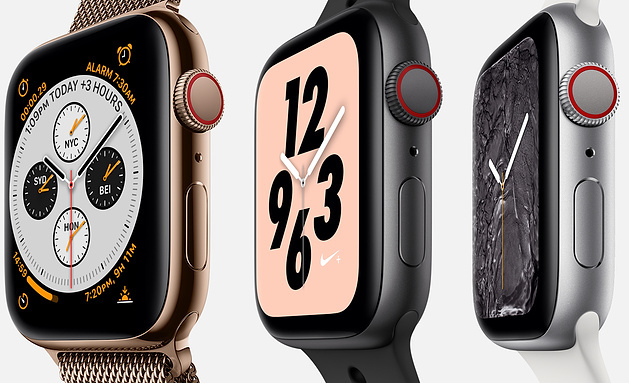 For the Apple Watch Series 4, Apple upgraded the display panel to a larger LTPO (Low Temperature Polycrystalline Oxide) OLED Retina Display, which means it is more efficient and consumes less power for better battery life. According to reliable Apple analyst Ming-Chi Kuo, the Apple Watch Series 5, coming in September 2019, will feature a new ceramic casing design, suggesting a possible return of the Apple Watch Edition. Other rumors suggest a future version of the Apple Watch will adopt solid state buttons that don't physically click but instead provide haptic feedback to users when the buttons are touched. Apple introduced haptic feedback for the Digital Crown in the Series 4, and haptic feedback could potentially extend to the side button. Today's report offers little clue as to what the switch to Japan Display OLED screens could mean for the next Apple Watch, save for a note that newer OLED technology is generally thinner and allows more flexibility than LCD screens. No, no, no, no, no. You need a nice rigid display for that classic Apple Watch screen pop. Could an OLED display lead to better battery life? Apple Watches have had OLED screens since day 1. They are just switching suppliers. Why are people here saying they can't wait for OLED screens in the watch, when they have been this since the 1st one came out? It's MICRO LED screens we have been waiting for. It would be appropriate at this point to go to a two-year watch cycle. Also, why can't we get more than one watch face that has digital seconds? For all the potential this device has, the lack of a "watch face builder" is really sad. Please let me arrange the complications how I want to. I could double the information on my watch face easily, only through using mid-size complications. And let us have complications on the iPhone lock screen, please. I'm trying to imagine what features it would take for me to upgrade my S4. Can’t wait for a oled IPhone SE2!! Just imagine for a moment a world where the side button has haptic feedback. It’s hard to imagine just how revolutionary that would be. I’m predicting a huge upgrade cycle.
" According to reliable Apple analyst Ming-Chi Kuo ('https://www.macrumors.com/2019/02/17/apple-watch-2019-ceramic-ecg/')...", how is this guy reliable? He just throws **** against the wall and see what sticks. Iphone 11 in september, better camera, faster processor - a true prophet, i tell you. "There have been reports of less-than-stellar sales of iPhone XR ('https://www.macrumors.com/roundup/iphone-xr/'), which uses LCD." But was the LCD the reason for the low sales? For me OLED was not part of the decision of getting an XS, it was camera and memory (RAM). I'd have been happy with LCD for now, in particular with how many Apps and web pages use a white background!